In 2004, Jon Stewart appeared on CNN's Crossfire and famously declared to hosts Tucker Carlson and Paul Begala that the show was "hurting America." Soon after, CNN cancelled the show. But now nine years have passed and CNN clearly no longer cares who it hurts, because Crossfire is coming back. CNN has announced it will revive the rancorous political program this fall, even cutting down Wolf Blitzer Reads People's Tweets To You by a half hour to make room in its schedule. The network's biggest problem in reviving Crossfire is how to avoid the original's reputation as a counterproductive shouting match. 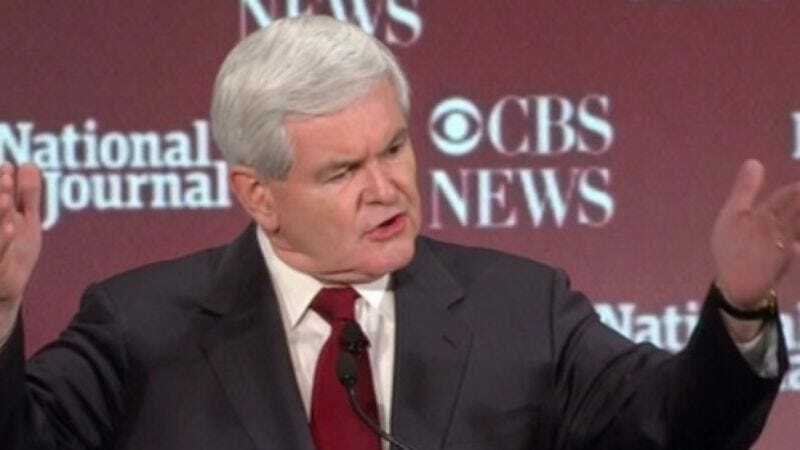 But fear not, because it's found an elegant solution: To reassure the public that the new Crossfire will be handled with the utmost of civility, CNN has secured that paragon of politeness, the gentleman's gentleman, Newt Gingrich. Yes, Newt Gingrich, the former House Speaker known for his even-tempered charm will be one of two conservative faces on what is sure to be a placid weekly discussion. He'll be joined on the right by conservative columnist S.E. Cupp, best known as author of Losing Our Religion: The Liberal Media's Attack On Christianity. On the left will be Stephanie Cutter, a campaign strategist who has worked for President Obama, John Kerry and Ted Kennedy; and Rebuild The Dream president Van Jones. Here's looking forward to many years of calm, civil discussion from all four.